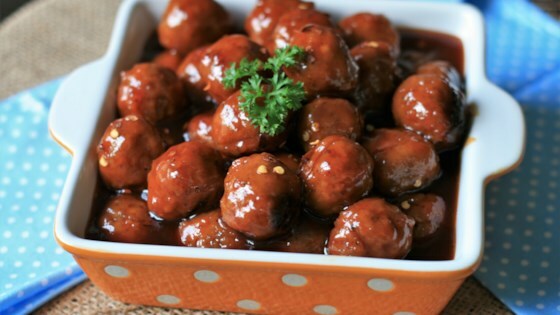 "A twist on the grape jelly cocktail meatballs that everybody loves. This recipe uses apricot preserves, but feel free to use grape, orange marmalade, or even cranberry sauce - they're all delicious! Try different flavors of barbecue sauce too! These make the perfect party appetizer, especially when you're low on time!" Turn on a multi-functional pressure cooker (such as Instant Pot(R)) and select Saute function. Add apricot preserves, barbecue sauce, water, and crushed red pepper and whisk together. Add meatballs and stir to coat. Close and lock the lid; turn venting knob to sealing. Select high pressure according to manufacturer's instructions; set timer for 5 minutes. Allow 10 to 15 minutes for pressure to build. Arrange meatballs on a platter with toothpicks and additional crushed red pepper, if desired.